2018 with the theme “Healthy Food, Healthy Living” was hosted by Chubby Cheeks Spring Valley High School earlier this month. The event saw young enthusiastic participants from different schools from Bardez, putting up 14 exhibits displaying nutritional benefits of traditional curries, local fruits and local vegetables. The programme was inaugurated by the Chief Guest, Vinson Pinto, Operation Manager White Square Nirvana Holiday Villas and Guest of Honour, Sidney D’Cunha, Proprietor of S & J Hospitality. They were very impressed by the presentations and congratulated the participants. With an endeavour to promote awareness of the nutritional benefits of the traditional foods our ancestors consumed among budding young students, this exhibition was one of its kind. Eminent personalities comprising of Vinson Pinto, Sidney D’Cunha, Rohini Diniz (Nutritionist) and Zhenya Lobo (Nutritionist) and Peter Fernandes (Chef) gave their judgement after inspecting each project on their own merit. Chubby Cheeks Spring High School secured the first place for the project, “Eat Smart, Be Nutri-Wise”. Holy Cross High School, Bastora secured the Second place for their project, “Local Vegetables”. 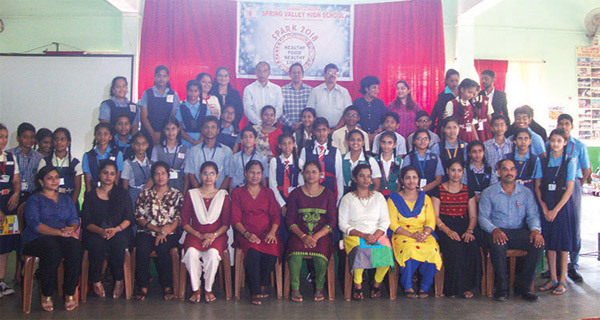 The third place was jointly shared by Keerti Vidyalaya, Siolim for their project, “Healthy Food, Healthy Living – Local Fruits” and Lourdes Convent High School, Saligao, for their project, “Eat Healthy, Stay Healthy”. An Appreciation award was bestowed upon Sanjay Centre For Special Education, Porvorim for participating in Spark 2018. The judges applauded the students for their novel ideas which would help us to be healthier through smart choices. Zhenya Lobo gave a session on ‘Significance of Nutritious Diet during Adolescence’. Akash Salgaonkar, faculty of CCSV HS, presented the vote of thanks. He thanked all the dignitaries, members of jury, participating teams, for making this event a success.